Barbara Wilcox, age 82 of Boone, died July 25, 2018 at the Madrid Home in Madrid. Following her wishes, Barbara has been cremated. A Memorial Service will be Monday, July 30, 2018 at 10:30 a.m. at the Schroeder-Reimers Memorial Chapel at Sixth and Marshall, with Rev. Doug Cue officiating. Barbara Jean (Anderson) Wilcox, was born in Little Falls, Minnesota on May 16, 1936, the daughter of Donald and Leona (Saulter) Anderson. She graduated from Boone High School in 1954. On September 18, 1954, Barbara married Duane Wilcox in Boone, Iowa. Over the years, Barbara worked at the Adobe Lounge in Boone and O’Brien’s Lounge, formerly in Boone. She loved crocheting, camping, playing cribbage with her husband Duane, and hosting her family for Thanksgiving and Christmas dinners. 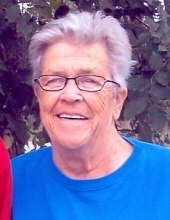 After retirement, she and Duane served as campground hosts at the Pine Lake and Don Williams campgrounds. She is preceded in death by her parents, son-in-law, Mike Sawyer, a brother-in-law, Jack Hiatt, and her in laws, Perry and Beatrice Wilcox. Barbara is survived by her husband, Duane Wilcox of Boone; her children, Donald Wilcox and wife, Betty of Ogden, Dennis Wilcox of Boone, Doreen Sawyer of Boone, and Debra Kruse and husband, Kurt of Madrid; a sister, Bonnie Hiatt of Sonora, California; seven grandchildren, Jennifer Madden of Ogden, Bobbi Jo Swain of Boone, Josh Wilcox and wife, Tracy of Boone, Todd Sawyer and wife, Cara of Burlington, Nick Sawyer of Boone, Blake Sawyer and companion, Sara Ray of Perry and Jessica Frey and husband Kevin of Madrid and 16 great grandchildren. Friends may call at the Schroeder-Reimers Memorial Chapel on Sunday from 3 until 8 p.m., where the family will be present from 6 until 8 p.m.
On Monday morning, friends may call from 8 a.m. until service time. To send flowers or a remembrance gift to the family of Barbara Jean Wilcox, please visit our Tribute Store. Family will be present from 6 pm until 8 pm. "Email Address" would like to share the life celebration of Barbara Jean Wilcox. Click on the "link" to go to share a favorite memory or leave a condolence message for the family.